"I used to work at a very fancy restaurant while I was in college. The best part of the job was making table side salads, entrees, and dessert. This was the best Caesar salad I have ever had! If having trouble getting the anchovy to mash, add a couple of croutons. They provide sort of an anti-skid surface, and the hard edges of the croutons cut into the anchovy." Mash garlic with anchovies in a large salad bowl. Whisk lemon juice, red wine vinegar, Dijon mustard, egg yolk, and Worcestershire sauce into the anchovy mixture until mixture is smooth and creamy. Gradually whisk olive oil into the dressing, pouring the oil into the dressing in a thin stream while stirring constantly. Season with salt and black pepper. 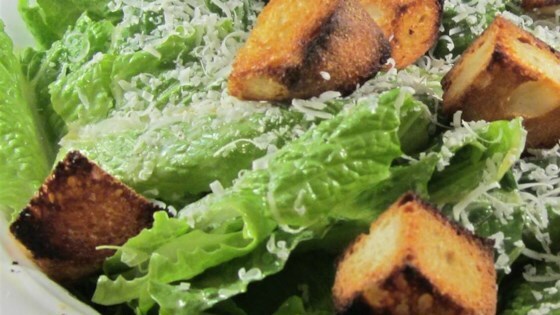 Gently mix romaine lettuce and Parmesan cheese into the dressing until thoroughly coated; serve salad topped with croutons. This recipe contains raw eggs. We recommend that pregnant women, young children, the elderly, and the infirm do not consume raw eggs. Great recipe. Easy to follow and liked by everyone even my non-salad eating husband!